Received a new DIR-880L yesterday. Initial setup was using OSX 10.9.3 using Safari browser. I connected the router to the ISP modem and when online with it. Used the Factory Setup Wizard that appeared in the browser to set up the basic options first. Wizard completed successfully including registered the router for the mydlink.com feature and was able to see the router on the mydlink.com web page from my home network. Router was online and I quickly had Internet services. Initial set up can also be done by D-Links QRS application as well on a supporting mobile phone. Select the gray pen on the client device tile to edit the client device settings, i.e. reservations. 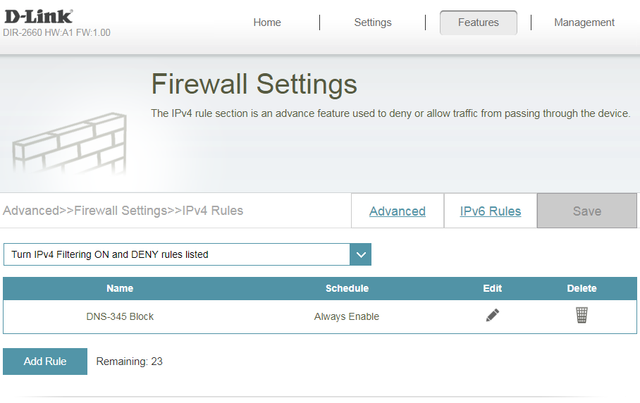 Firewall: DMZ, SPI and IPv6/v6 rules are here. 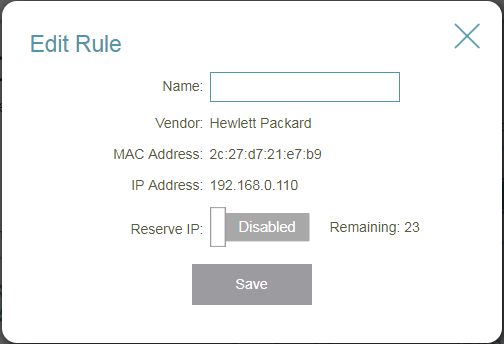 NOTE: So it seems that since all WPS security issues have been fully resolved and fixed, as I presumed, D-Link has removed the configure WPS option from this model router and will not be adding it back in. It's just automatic. I presume that when it's not in use, it just idle or waiting at the ready to be used. Press of the button and your off and running. Thats all there is to it. USB: It has 2 USB ports, 1x USB2.0 in back and 1x USB 3.0 on the left side. 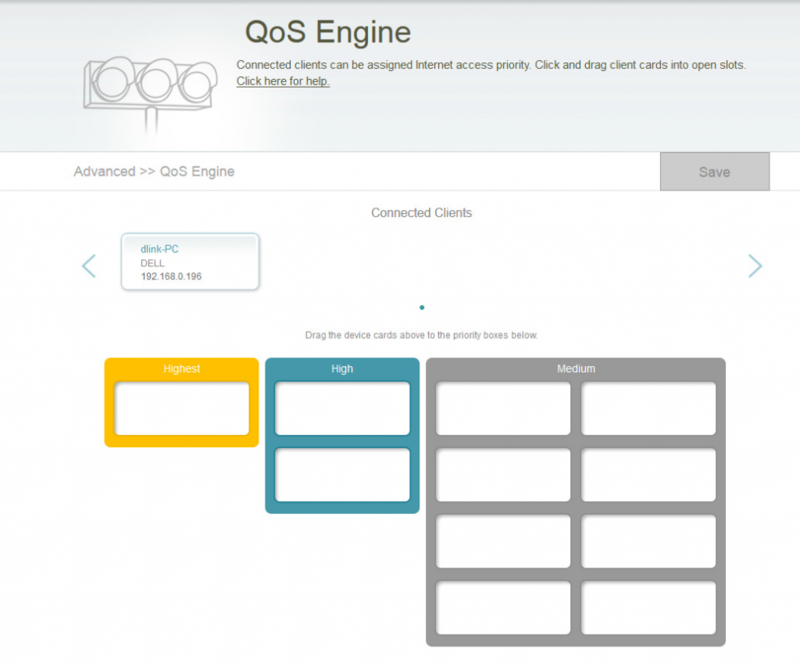 QoS: Drag and drop your devices into the management priority section boxes and thats it. *Not sure how multiple gaming devices will work since only 1 Highest priority box is available if this is used. 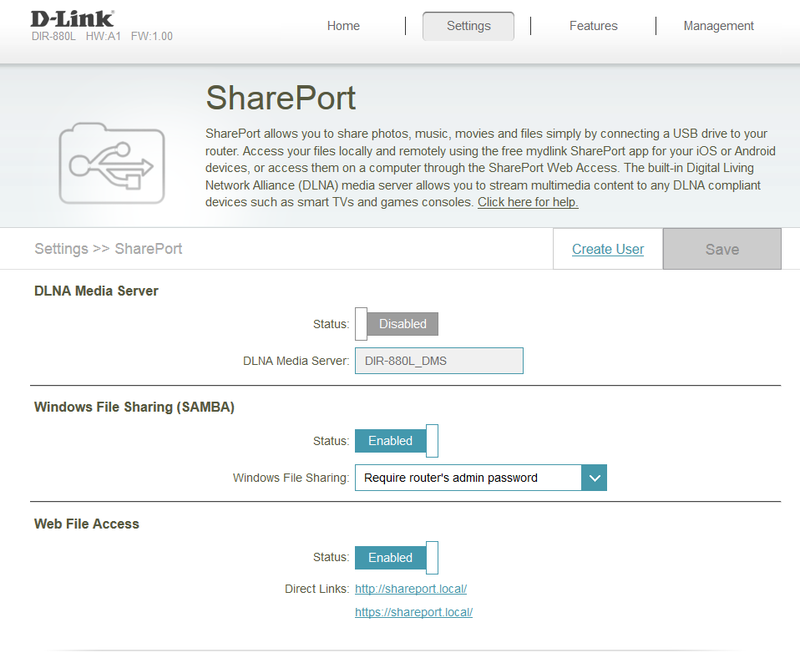 SharePort Services: DLNA and SAMBA ready. Scheduling: A better way of configuring schedules. Any yellow highlighted sections are enabled. Any white un-highlighted sections are disabled. 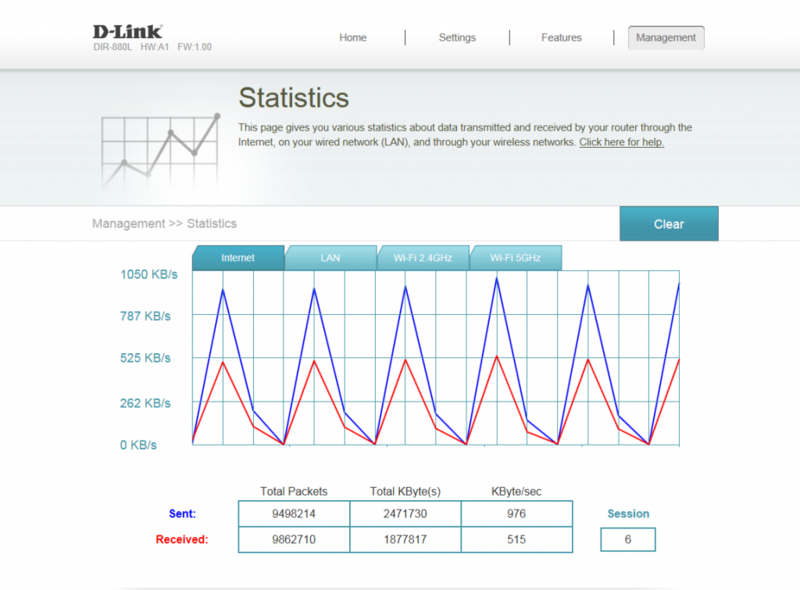 Statistics: Live and real-time data speed rate graphs for connections through the router. Steam some raw BD video to Boxee Box using DIR series bridge. Streaming raw BD files between the 880L and DIR-865L in bridge mode is ok. There is buffering happening over so often. I wonder if this could be due to the extra intensive data packets of raw BD files and could be due to how Boxee box is handling even though I don't see buffering on Boxee if I'm streaming on wired LAN. The Boxee is only 100Mb while rest of network is Gb. So I presume streaming raw BD files over wireless could be some processing between the radios thats happening to cause intermittent buffer. Streaming raw DVD files is flawless since they are less intensive. I watched a full DVD movie with out issues over 5ghz. Game on XBL using 5Ghz radio and Bridge. 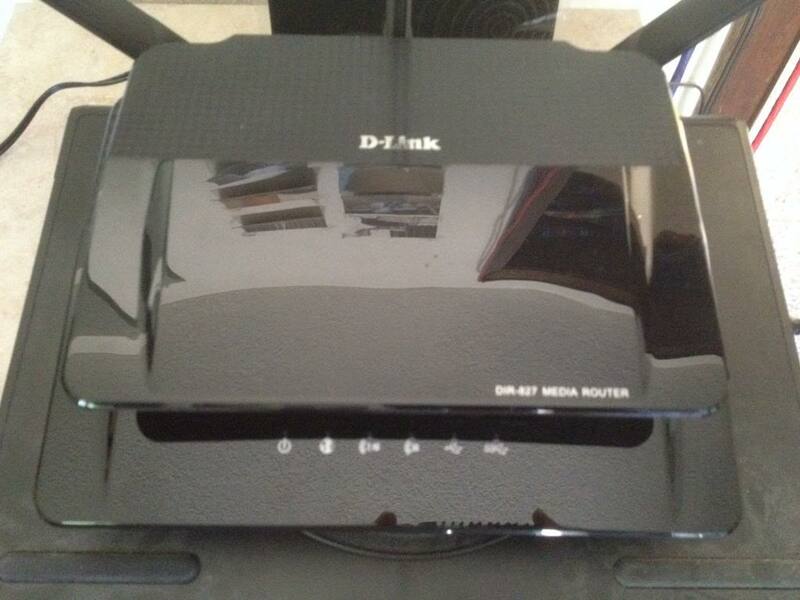 6/2/2014: Gaming on XBL with 360 connected to a DIR-868L bridge to the DIR-880L last night was great. No major issues seen. I downloaded a 1.5Gb map pack which took longer than expected however it was a new release yesterday so others downloading it at the same time may have been effecting the download. I wasn't seeing much over 650KB when looking at the 5Ghz graph page on the 880L while this was going on. Gaming was great, no lag see cept for one which I believe that was service related. Over all was great gaming on a Bridged 5Ghz connection. Will figure out a way to get multiple game consoles tested. The Bridge was at a 15ft distance with one wall in between the Bridge and Router. 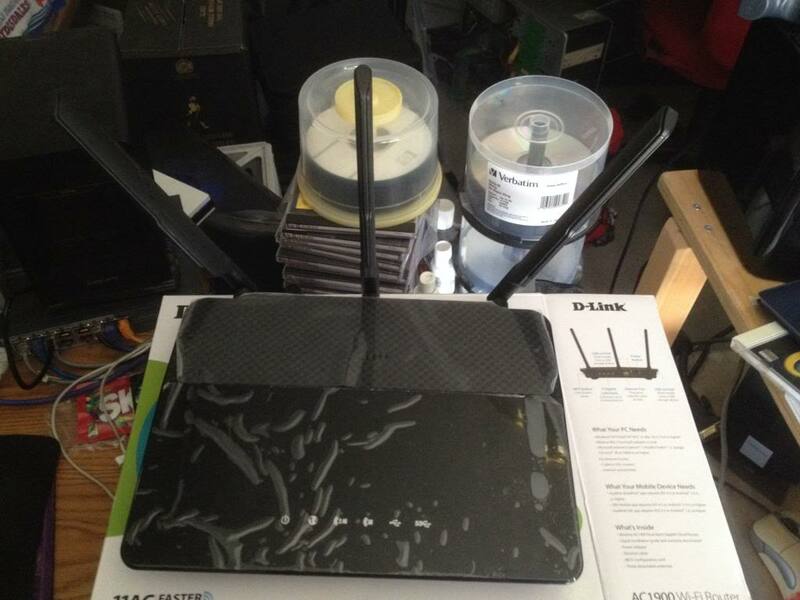 Over all this router was a breeze to set up and was quickly online and at Internet speeds to spec. The new UI is pretty snappy on performance when navigating and nested features are easy to find. 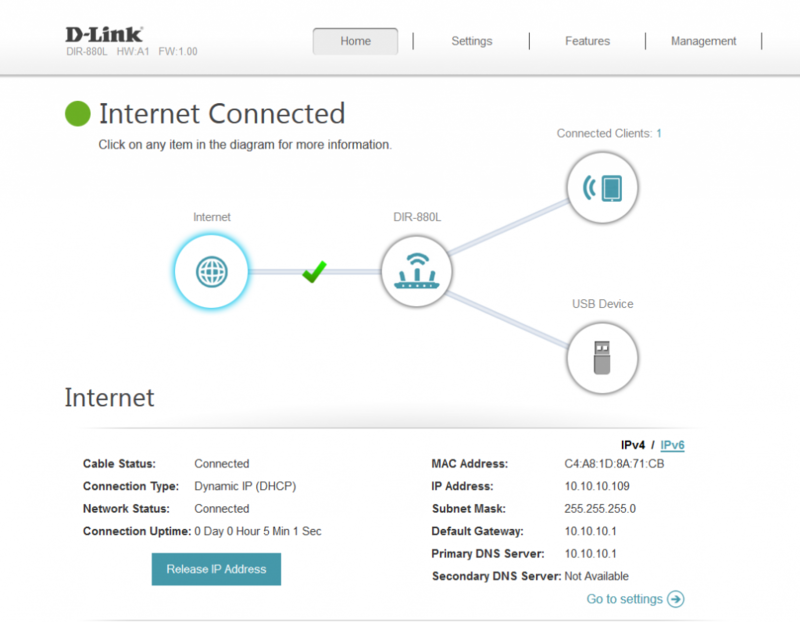 Those familiar with D-Link's current router web pages will find this fairly similar and easy to use. Just the look and some feel is different. I presume that D-Link is headed to a more less complex web page UI for users to use. The wireless range from my initial testing is very good. I sat in my living room with my Mac Book Pro while the router was 20ft away down the hallway in the office and had full signal bars on 2.4Ghz. Same room testing and all wired results are for public review in the provided link below. 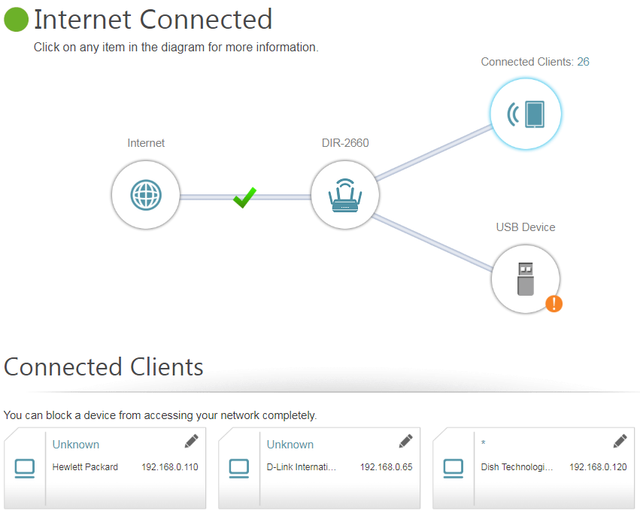 Only issue I have is that it's hard for users to see what actually there wireless devices are connected at with the router. 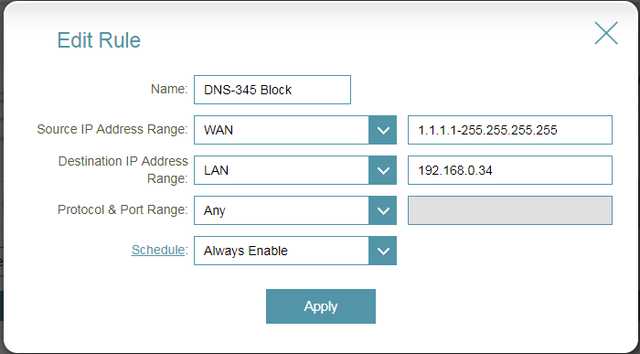 On current DIR series routers, we have a Wireless Status page that gives the device connection rates and signal percentages. This is not available on the 880L and it would be nice to have this feature added in for troubleshooting and diagnostic reasons. Knowing connection rates if very helpful. With the use of the Amply line router case, it seems D-Link has listened to some concerns about heat and cooling. 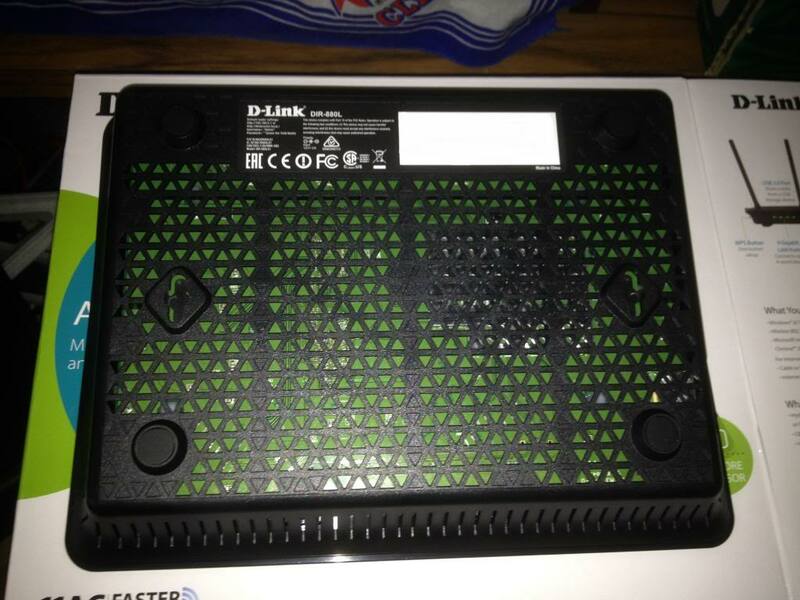 The entire bottom case is perforated with air holes for cooling. I opened the top cover to find a large metal heat sink instead of composite ones. 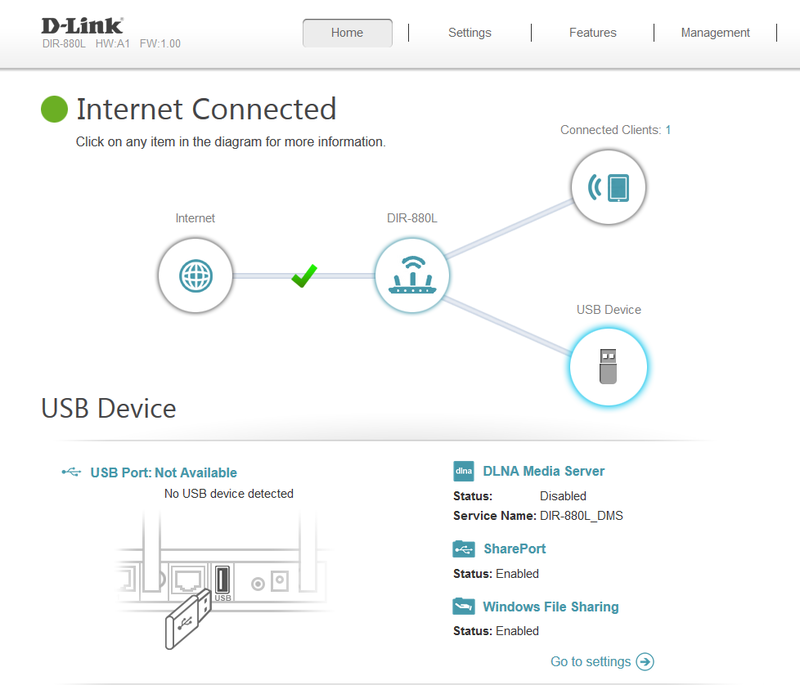 Thank you D-Link. I still wish the top cover had more air cooling holes for ventilation, however running this router in a 80F room with no cooling or additional forced inducted air, the router ran warm and with in specs while testing and seems to have adequate heat cooling and ventilation. I tested on a flat desktop surface. Bottom temp got to around 115F which was a bit hotter. I'm going to use a Laptop cooler when in normal operation any ways. I presume normal air conditioned room environments will suffice for cooling. I would recommend placing the router on a wooden sloted rack or a form of sloted elevated placement instead of a flat surface, just so the the router be provided the best air ventilation as possible for long term operations. Only item I'd like to see in for future would be a dark color or dark Gray back ground UI instead of White. Looking at white all the time gets my eyes burned out and tired. Having a dark color back ground would be nice on the eyes. I might add this to the features request. 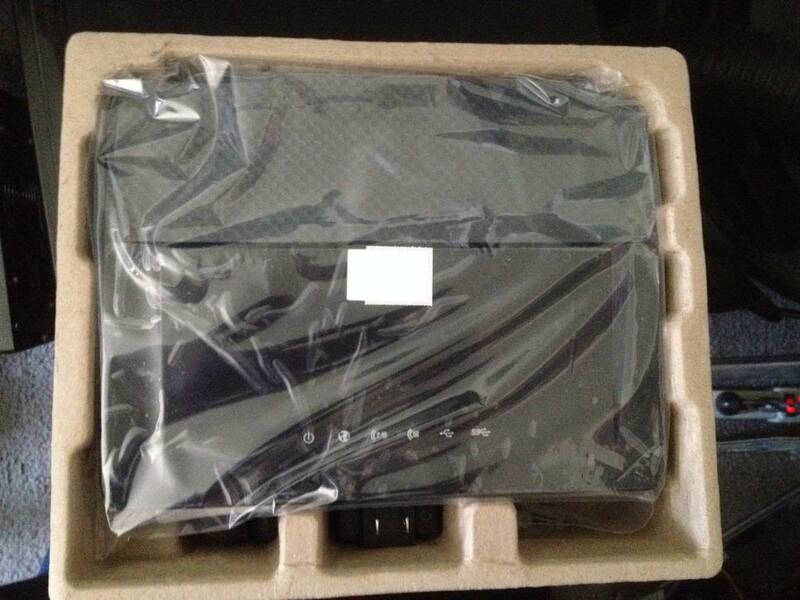 For the most part, this is a great and stable router and seems to be working well for me and I'll continue to test and play around with the router and post more results and thoughts. 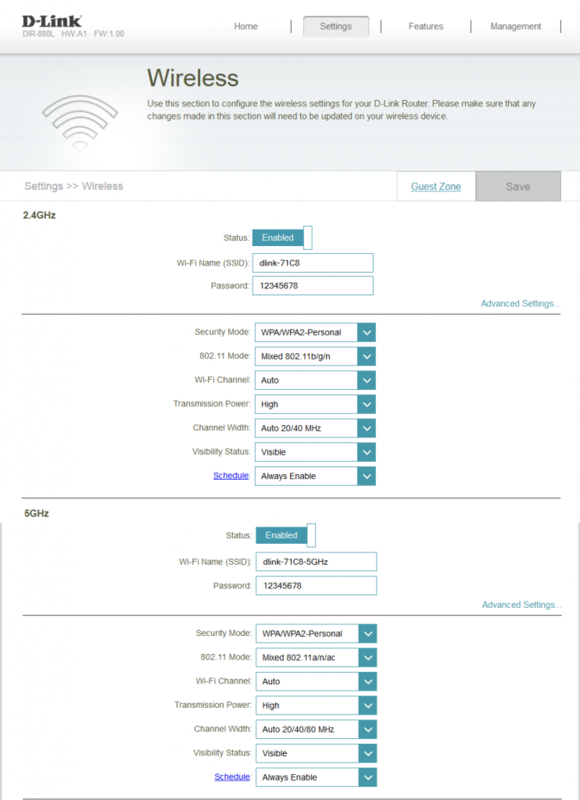 I've found a few FW items that I have made D-link aware of that will be reviewed, and corrected I hope. 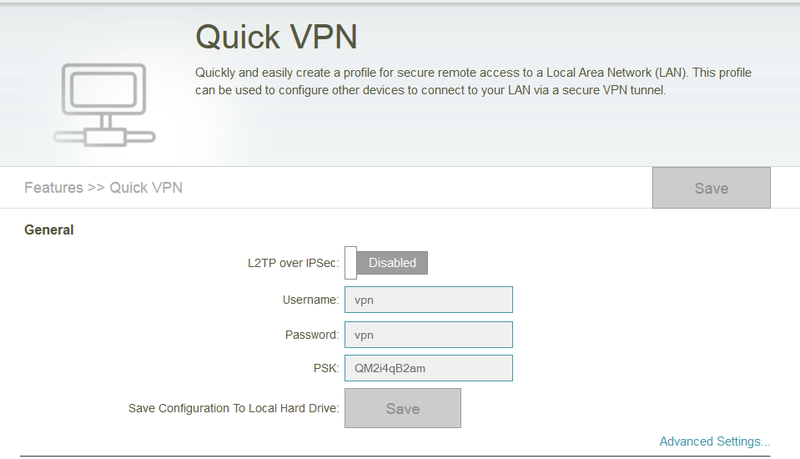 I would and will be recommending this stable router. Wireless device connection status and rates. 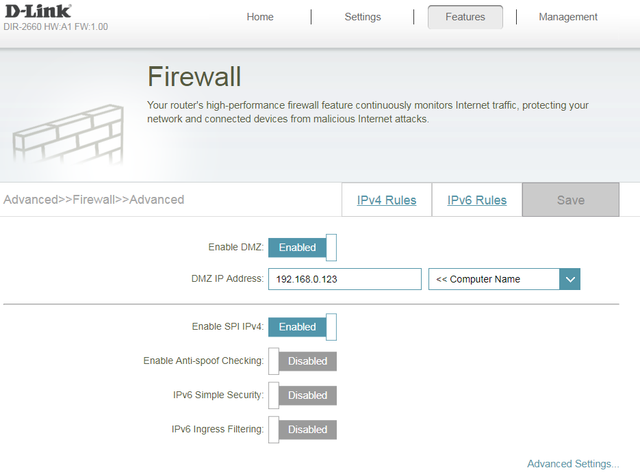 Wireless Security mode options, no selectable TPIK or AES only. I presume it's all automatic now. I was thinking, since the 5Ghz AC wars have started...this might mean that wired 1000Mb LAN may be come the new bottleneck in networking speeds and in a router? I thought about this last night when I connected my, Boxee Box, DIR-865L to the 880L and thought, gee, both routers support 1300Mb on the radio and yet the LAN ports and my current networking configuration is all 1000Mb on the wire...I presume that if this keeps going that current GB wired configurations could not handle the higher connections being attained on WiFi? I see that another Mfr is now going for AC3200. Oy vay. I removed the Gb switch while testing the bridge out. So could this mean that the use of 10Gb wired connections should be looked at? Ya, I've future proofed my new addition with CAT6A. Still, 10Gb switches and supporting HW isn't mainstream yet for home use that I can find. 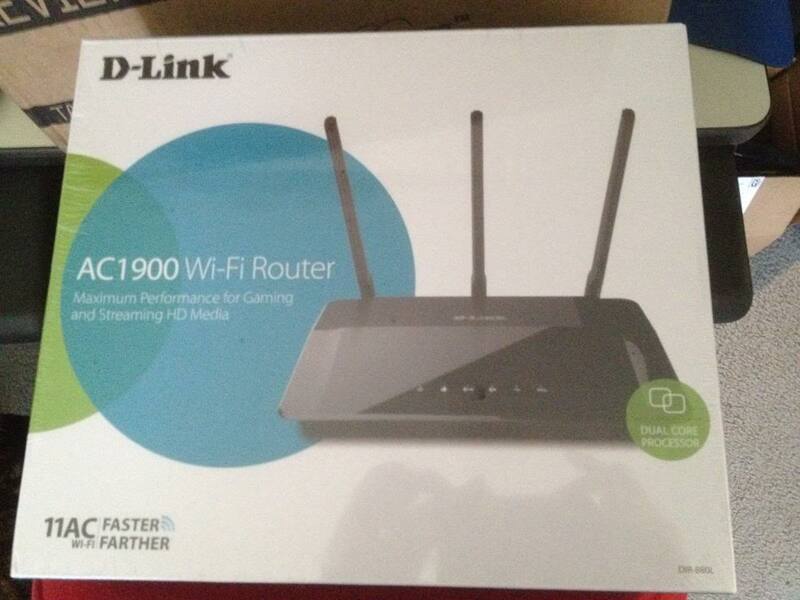 Update: 10Gb won't be coming to retail routers any time soon. Costs is still way to high and it's only being used in Enterprise networking environments. I've been told that Gb wired LAN speeds still way out perform WiFi currently.